Been a while since I used it, but doesn't it use custom shaders, and if so they will not convert well to Iray. I usually just apply the iray uber base to any 3Delight shaders and it works just fine. Not sure why these don't. I am not really sure about how the botgen works (all that clothes and materials nonsense). I assumed you had to add the provided shaders after making the joints from 'clothes', but maybe you can just use any old shader? Is it only the 'clothes' part that creates the robot figure then? Just using the iray Uber Base won't work for Bot Genesis. 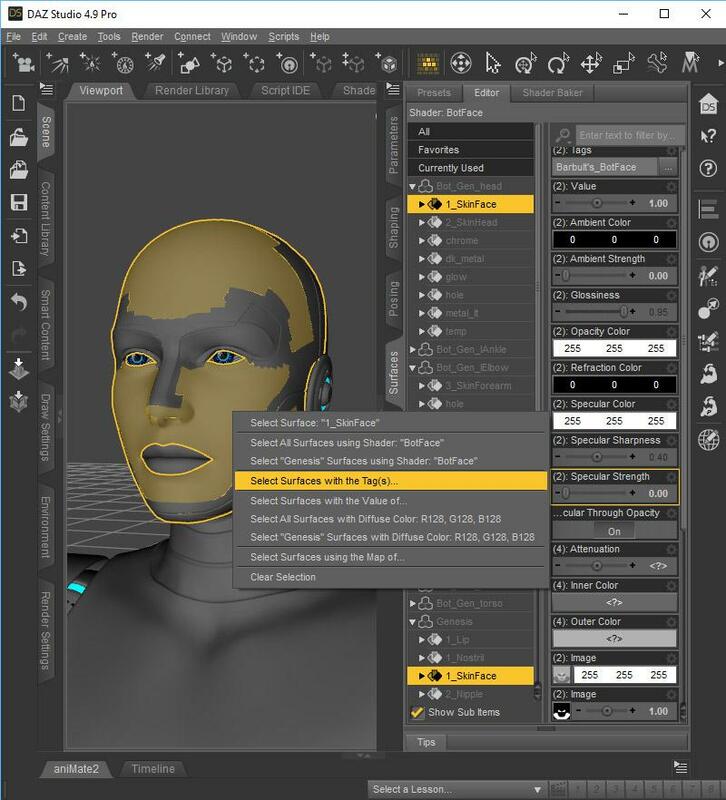 It uses custom shaders -- if you look at the shader name, it won't say Subsurface or Ubersurface or HumanSurface or any of the typical shaders that Iray knows how to convert. Since this is a custom shader, Iray doesn't know what to do -- the names of the surfaces and settings don't match up with what it "knows". You'll need to select each and every desired surface and then apply an actual Iray shader -- not just the base -- to make it do anything. Basically, the existing shader needs to be wiped out and replaced, rather than simply converted. I converted the shaders to Iray for this image, and I had to select all the metal surfaces and put an actual shader on them, and then the light surfaces and convert them to emissives, and and and ... it took forever. Worth it, overall, but it does take some patience. I do hope Parris comes out with a G3/G8 version of Bot Genesis eventually. Great! thanks so much for this advice. I have never come across a shader before that iray uber base couldn't deal with. I guess I have now! Seriously, you guys rock! Instead of applying the BotGen custom MATs I just added the BotGen clothes to a Genesis figure, then manually replaced all the materials to iray ones. Boy that took ages! BotGen has SO MANY surfaces!! Anyway, very happy with the results. Now save that as a Preset so you can re-load with a single click! If you have the surface selector tool highlighted you can right click on a surface and select all the surfaces with the shared value at the same time, very quick. All glowing areas for instance. Then you can tag them to make selecting even easier next time. edit/add: Tag them after you have converted to an Iray surface. OMG!! that is SO useful! I never knew about that little gem. Thanks! @Marshian What does it mean to Tag a set of surfaces? How do you do that? It sounds useful. At the top of any surface in the Surfaces Tab is a text box labeled "Tags". You can create your own tags by putting text in the text box (multiple tags should be separated by a comma). Then once you have tagged some surfaces, with the Surface Selection Tool active, you can right click the figure and choose "Select Surfaces with the tag(s)". I hope that helps. Much thanks to Marshian and others for helping out. Sorry this creates such a challenge for folks. Hey, no worries. It's not too hard to solve. And your Bot is still by far the coolest robot available. I just love it!